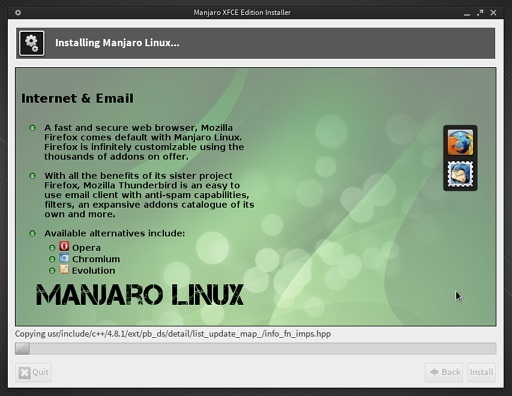 ‘Manjaro’ is a GNU/Linux distribution that is developed in Austria, France and Germany. It is based on Arch Linux’s core, although Arch Linux is famous for being a fast, lightweight and for having bleeding edge software, a package manager of its own (‘pacman’) plus, has one of the best documentations available on-line -- covering various topics of GNU/Linux, it is a bit difficult to set-up and thus is not that popular among those who are new to GNU/Linux. ‘Manjaro’ on the other hand tries to prevail where Arch Linux has ‘failed’ and thus, it comes with an extremely easy to use graphical installer. It also comes with proprietary multimedia codecs & GPU drivers, Xfce as the default desktop, and being based on Arch, ‘Manjaro’ users also have access to the ‘Arch User Repository’ as well. To be honest, I have never used Arch Linux, though I always wanted to!, some of the above mentioned drawbacks kept me from trying it. After looking at some of its (‘Manjaro’) recent releases, added improvements (such as the GUI installer) and gorgeous looking screenshots, I decided to give it a go. ‘Manjaro’ 0.8.7 (Ascella) was released recently but the official disc images have received another update (mostly consists of UI changes). So in this review I am using the 0.8.7.1 version (64-bit). The Kernel version is 3.10.11, XOrg 1.14.2, Mint Display Manager 1.3.1, Pacmac 0.7.5.2 and Xfce 4.10. 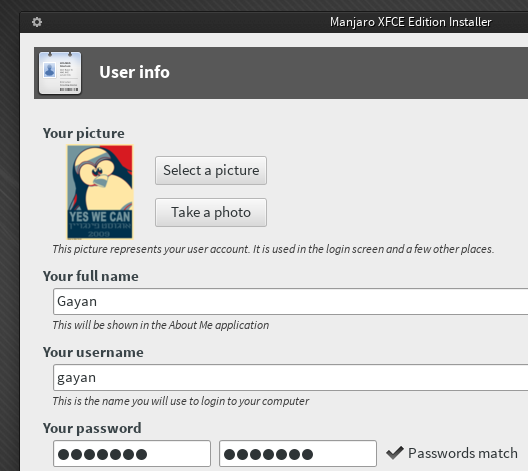 As said above, the graphical installer is one of the key features of ‘Manjaro’ Linux and it was introduced recently. The first time I tried to used it, out of no reason, it showed my primary hard disk as ‘sdb’ and recognized the USB pen drive as ‘sda’ which should be other way around. Nevertheless, I carried out the installation and it failed while trying to install the GRUB loader and broke my system!. I used Ubuntu to fix it and then re-put the ISO image into the USB, and this time it worked and the primary disk was recognized as ‘sda’ and the USB as ‘sdb’. On both occasions, the web cam was turned ON from the beginning of the installation to the finish. If the GUI is troublesome, then you can always use the ‘ncurses’ installer that runs within the terminal emulator. Other than those, the installation went well. 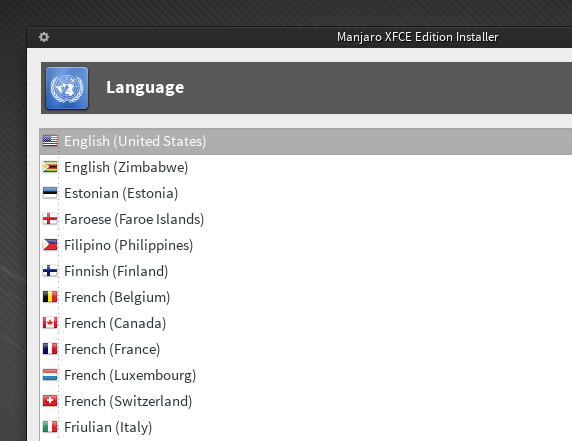 As mentioned above, ‘Manjaro’ 0.8.7.1 comes with the Xfce desktop, version 4.10. I am not going to go into details of Xfce 4.10 as pretty much everyone is aware of them plus, I am not a Xfce user and have very little experience with it. That said, the desktop comes with a nice feature that shows large thumbnails on drop-down tips and a very feature rich right-click context menu that lets you adjust various settings such as changing the background, create file/folders, search, open Terminal etc. 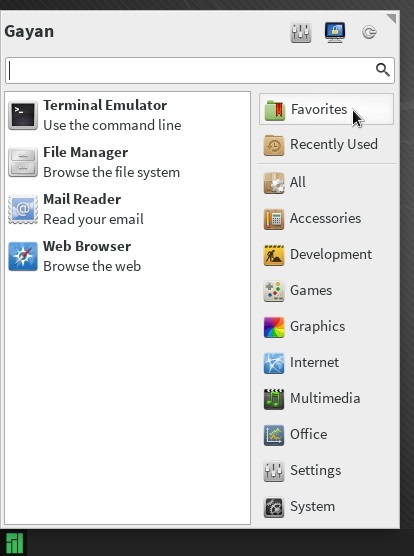 ‘Whisker menu’ is a start-menu for Xfce that looks like the one of Microsoft Windows. It shows your ‘Favorite’ apps at the middle and groups Recently used ones and the rest in clear, well grouped menus, on its right-side. It also supports searching and lets you access primary functions such as Screen lock and Log-out functions as well. 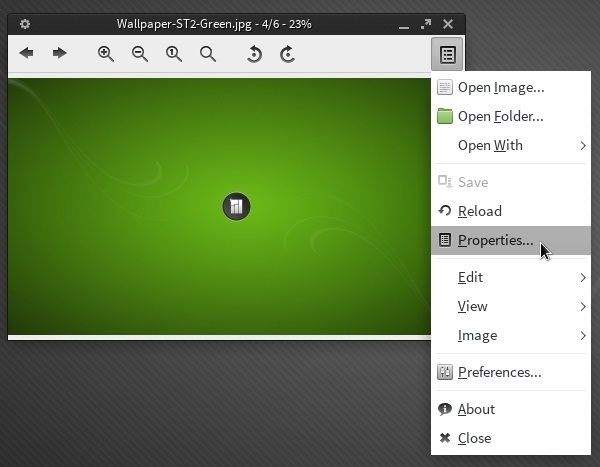 All in all, it is a clean looking application launcher which when combined with the rest of the Xfce desktop (desktop icons, bottom taskbar) should make Windows users feel more confident and at ease (until they discover that they cannot run native Windows apps that is 🙂 ). 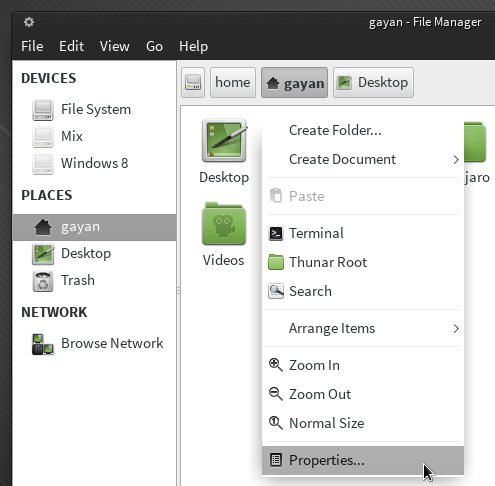 ‘Thunar’ is the file manager used in Xfce. 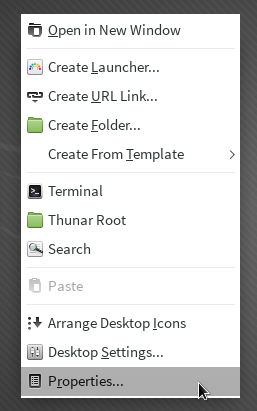 It looks a lot like ‘Nautilus’ -- now called ‘Files’ (default file manager used in GnomeShell) and gives you a additional features out of the box (such as the ability to open a Terminal emulator window in any location, run ‘Thunar’ as ‘root’/’administrative’ privileges). Not only ‘Thunar’ displays thumbnails for images, documents (PDF, texts), the one in ‘Manjaro’ creates ones for videos (thanks to ‘ffmpegthumbnailer’ I suppose) which is an added bonus. It would have been better if the thumbnails were a bit more larger, but I like it. 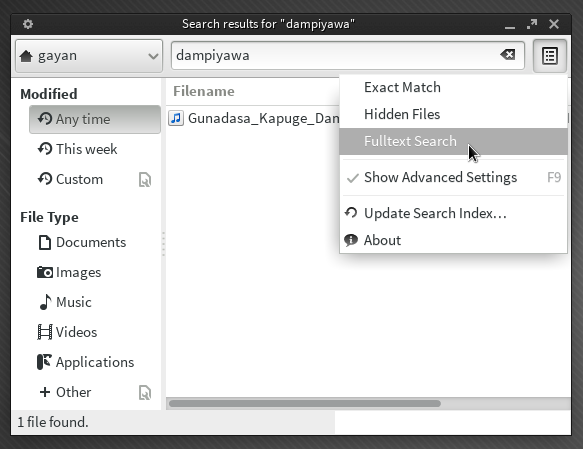 I am not sure whether Xfce 4.10 comes with it by default or ‘Manjaro’ developers have added it manually, you can quickly and easily find files by simply right clicking (both on the desktop and in ‘Thunar’) and choosing ‘Search’. This opens the ‘Catfish’ file indexing tool, and it is pretty fast too. Xfce 4.10 comes with a powerful ‘Settings’ window (a true ‘command-center’) that gives you access to pretty much everything (Appearance, Desktop, File Manager settings, Login tweaks, Panel, Notifications, Screensaver, Workspaces, Display, Power Management -- best of its kind as you can tweak a lot of power related options, and a lot more). ‘Manjaro’s’ disc image is a bit larger than many others (about 1.3GB) within which the developers have added a number of useful and most commonly used applications and thus, once you install it, on most occasions, you would not have to worry about installing anything manually. Manjaro comes with LibreOffice suite (4.1.1.2), GnomeShell’s document viewer (3.8.3), dictionary application (needs an internet connection), simple desktop calender and a clock that displays time in different time zones. GIMP 2.8 is included by default. The default image viewer is ‘Viewnior’ -- a fast and lightweight tool. 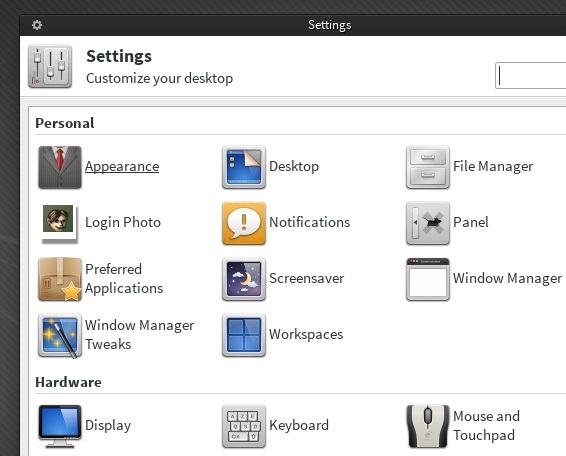 Firefox (23.1) is the default web browser, Pidgin 2.10.7 is the messaging client, Thunderbird 17.0.8 is the e-mail agent. 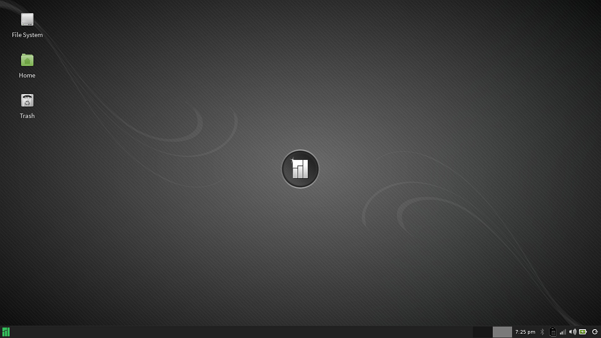 Manjaro also comes with Steam’s GNU/Linux client installed and configured by default. I am sure a lot of users will appreciate that. Qt 4 (4.8.5) and OpenJDK software development environments are also included. As mentioned in the beginning, ‘Manjaro’ ships proprietary codecs by default. 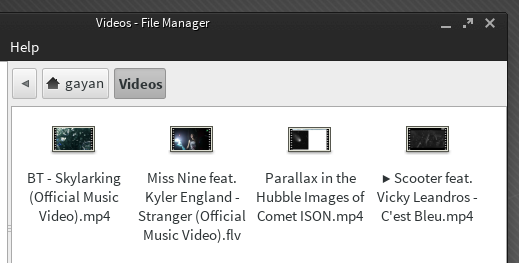 Default music manager is ‘Xnoise’ (0.2.18) due to its versatile features and the media player is VLC (2.0.8). They both of course supports minimizing to the system tray area. 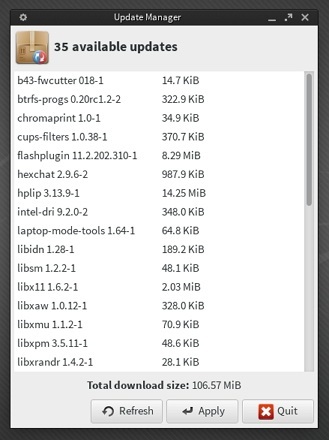 ‘Manjaro’ has a software updater of its own. It periodically checks for updates and asks for your permission to install them (if there are any), and looks very minimal. If you do not want to deal with ‘pacman’ (CLI) package manager then you can use the built-in GUI package manager (‘Pacmac’ 0.7.5.2). If one of your desired applications is not available, then you can install them through the ‘Arch User Repository’ with ease, using these tools. P.S GParted (partition manipulator) is also available by default. As always, after installing the OS, the first thing I did (before messing with the installed software) was measuring the performance related details, as I wanted to keep the OS as ‘fresh’ as possible to avoid any unnecessary influences from the installed software applications. For that same reason, after installing, I also logged into the desktop, let it idle about 30-40 seconds, and then shut it down. I did it 5 times for letting the OS ‘settle’ down (you know, to be done with creating user profiles and other settings etc). While measuring, I took approximately 5 samples from each of these tests for calculating an average value as well. I know that it is unfair to compare ‘Manjaro’ with Ubuntu, especially because they rely on two entirely different desktop environments (plus other core OS tools). 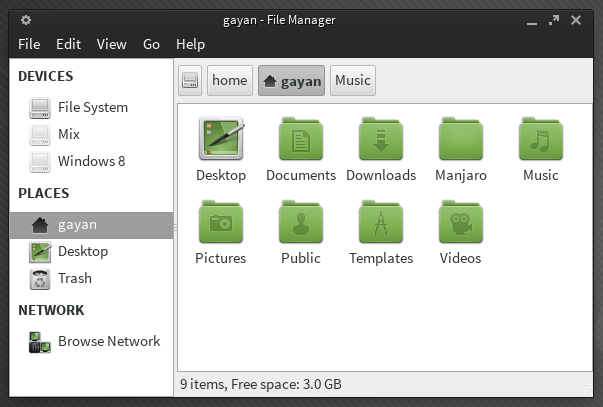 And the closest ‘match’ that I had, or a desktop that closely resembled the desktop UI that ‘Manjaro’ renders was Linux Mint. So rather than using just Ubuntu 13.04, I decided to add Linux Mint 15 data that I had for the comparison as well. Below is the graph that I created for boot-up times. 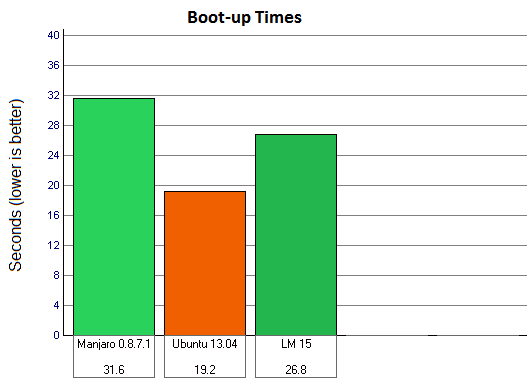 As you can see, Ubuntu was 65% & Linux Mint 15 was 18% faster to boot than Manjaro did. Why is that ? I do not know the exact reason, but both Ubuntu and LM 15 use ‘ureadahead’ -- a tool that significantly improves the boot-up times. Xfce is not as lightweight as it used to be but it is still lightweight when considered the useful features that it presents the end-users with. After measuring the boot-up times, and before measuring the memory usage, I manually disabled the ‘Update Manager’ to avoid memory ‘spikes’. Here is the graph. Update: Guys, I made a small mistake. And that is; my GPU allocates memory from RAM, so not all 4GiB is available for applications. This however, has never been an issue while measuring the memory usage as all the system monitors that I previously used showed the used memory in Mebibytes, but the one in Xfce 4.10 shows it as a percentage, and it does not show the totally available memory either, which would have otherwise solved the problem. 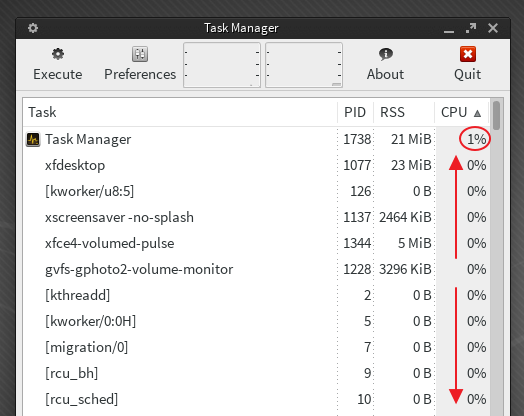 Anyhow, to be fair, I re-installed Manjaro, and then installed ‘LxTask’ system monitor as it directly shows the available memory in total, and how much of its is in use. So based that, again I took 5 samples and came up with the below graph. I really am sorry about all this. 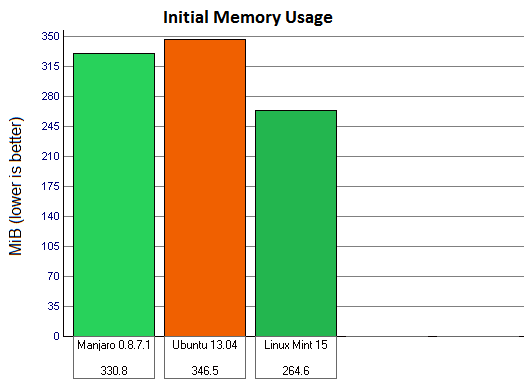 As you can see, Manjaro used about 4% less memory than Ubuntu 13.04 did, though ‘Cinnamon’ in LM 15 was still impressively lightweight as it was still 25% more memory efficient than Manjaro Xfce. I did not spend time trying to figure out the exact reasons behind these different memory usages, but Manjaro was actually the most memory hungry of the three. Respectively, Ubuntu 13.04 (with Unity) was 6% and LM 15 (with ‘Cinnamon’) was 39%! more energy efficient, than Manjaro. When a computer idles, meaning that the CPU has no processes in its waiting list for immediate execution, its usage should drop to zero. Xfce too did a pretty good job at idle. Other than the task manager itself that, most of the time, kept consuming 1-2% of CPU, rest of the processes did not interrupt the CPU. Like always, I used ‘powerstat’ for measuring the power usage. This tool gathers 45 power usage data samples of your computer (at idle, in this occasion), with each sample consisting data from 10 seconds, then based on the data it calculates an average value. Before measuring, I had disabled Bluetooth, Wi-Fi turned ON and set screen brightness to maximum. As you can see, Manjaro is impressively energy efficient (14% lower). It also spin-down the disk drives a bit more aggressively than Ubuntu and LM 15 do and thus, the disk was spun-down most of the time and so it should contribute 0.5-0.6 Watts of power reduction to the test. The remaining 1 Watt might be due to HDD’s ‘ALPM’ as when enabled, it can reduce around 1-1.5 Watts. 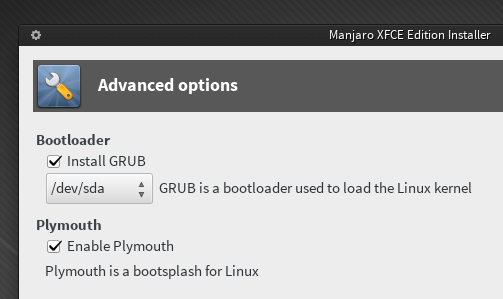 That said, I am not sure if it is enabled on Manjaro (I think it is disabled in Ubuntu). 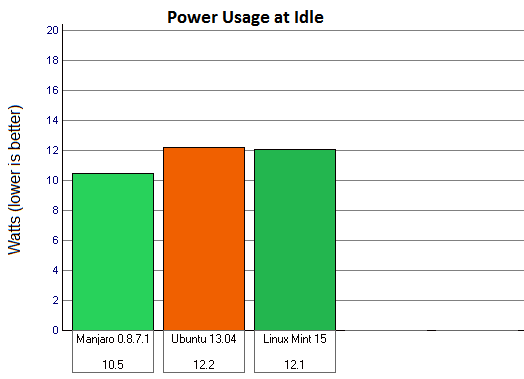 Note: One thing that is also worth noting is that (though it should have a minimal effect on power usage), unlike recent versions of Ubuntu (cannot remember whether LM 15 comes with it), ‘Manjaro’ uses ‘Laptop-Mode-Tools’ for optimizing power usage. Sure it is a great tool, however, when I used it in Ubuntu in the past, it had this bad habit of putting my USB mouse sleep. Once the USB mouse is put to sleep it stops working (obviously), but when you move the mouse the OS should ‘wake it up’. That however did not happen in ‘Manjaro’, though I tried what have worked for me under Ubuntu in the past, sadly it too failed. So perhaps it is that something else is forcing its way into it and is responsible for that (Xfce power-manager plugin perhaps ?). I did what I always do to see how the OS perform under reasonable stress (for a desktop computer). 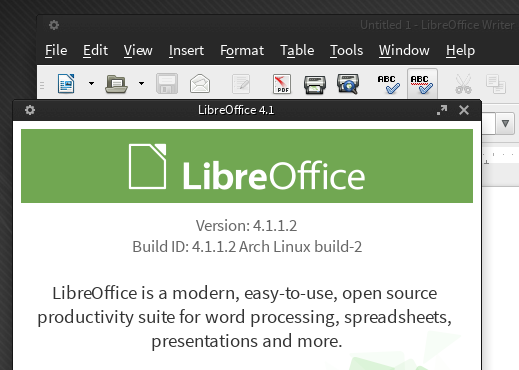 While copying a file that is about 1.5GB within the ‘Home’ folder, I clicked on the start-menu and opened LibreOffice Writer, searched and opened Archive manager, Terminal emulator, Gedit, Image viewer. Then used the category menu and opened Firefox, Thunderbird, VLC (and started playing a video), opened document viewer and ‘Settings’ window. How did it go ? It was flawless!. Extremely low level of lag in responsiveness (if none at all! ), video playback was undisturbed … it was perfect and I could not have been more happier. The fingerprint reader is not supported by GNU’s Kernel. Iike with many other distributions, Bluetooth gets turned ON automatically and brightness gets set to its maximum, every time I log into the desktop. As said above, my USB mouse stops working when running on battery and it is very irritating. Other than that, rest of the hardware worked with the OS (‘Suspending’ included) without major issues. Before I say this, let me just say that I am not an expert on this. This is something that I observed and I am just putting it out there. When my computer shuts down properly (despite what OS that I run), the SATA disk makes this extremely low ‘clack’ sound. But, if I had to turn OFF the laptop forcefully, then just before turning OFF, the hard disk makes a loud sound (a more intensified ‘clack’, followed by another) and I assume that it is the HDD’s ‘arm’ forcefully ( ? ) being parked, due to the sudden power cut. Now I do understand that it is up to the BIOS to send the final ‘turn OFF’ signal, but before that, according to my limited knowledge, it is the job of the operating system to properly let the hardware know that it is going for a shutdown and thus they can make the proper preparation (such as properly parking the ‘arm’ of a spinning disk drive). There is nothing wrong with my disk drive as it quietly shuts down under Windows 8 (I just tested it), but every time I shut it down through ‘Manjaro’, it makes this loud sound. And in rare occasions, it shuts down quietly (as it always does) under ‘Manjaro’ as well. The SATA disk is fine actually. But again, due to my lack of knowledge, I am a bit concerned, because nobody like getting their disk corrupted!. If anyone knows a proper explanation, then you are very welcome to do so. 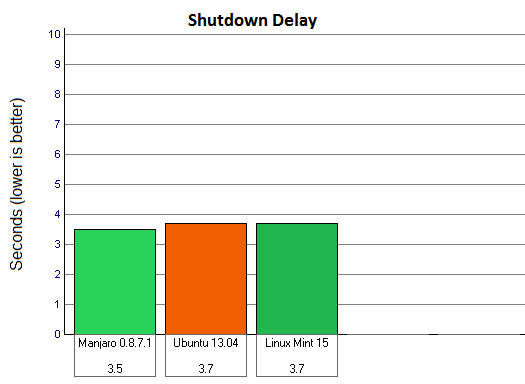 ‘Manjaro’ was also pretty quick while shutting down as you can see from the below graph. However, these measurements were taken without having any programs opened. So in actual circumstances, depending on the load on your RAM, it could take add a few more seconds. ‘Manjaro’ packs pretty much everything an average desktop computer user needs to get his/her work done. It is not impressively fast to boot, but is so while shutting down. It is also extremely responsive, comes with few proprietary software installed by default (multimedia codecs, Flash Player, drivers) and a lightweight Xfce desktop, though ‘Cinnamon’ was still impressively lightweight. That said, if you are a fan of the Xfce desktop and if I am simply mistaken on that HDD turning OFF issue, then I highly recommend it to anyone. But honestly, I am a bit concerned. And if it is an issue, then it is probably the Kernel’s fault. 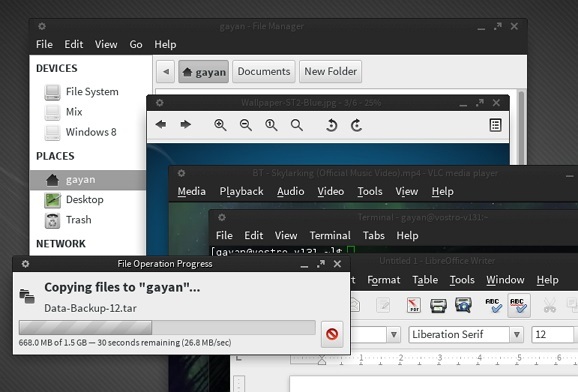 After all, Manjaro contains bleeding edge software, remember ? Nevertheless, despite all that, it is very clear that ‘Manjaro’ developers have put a lot of efforts into it and are indeed have succeeded, if it was ever their intention to take something a bit hard to ‘maneuver’ such as Arch Linux, and create something that is extremely user friendly. Nicely done!. Please go to this page for downloading it. Here is the release note page for 0.8.7.1. Good luck. Update: You can also use other desktop environments (Cinnamon, KDE, MATE, E17) with Manjaro community editions, though the official releases only support Xfce and Openbox (if I am not mistaken). A thanks goes to ‘HardyH’ (below) for pointing it out. Arch is desktop agnostic, it does not come with a DE or recommend one over another. I updated the post, thank you. I have also made a mistake while measuring the memory usage, so I have re-measured it using ‘lxtask’ and have updated the post concerning that as well. To measure memory usage have a look at at ps_mem.py https://raw.github.com/pixelb/ps_mem/master/ps_mem.py which is really cool for measuring memory usage on a system and to show how much memory and app/process is using..
Arch/Manjaro does not come with readahead enabled by default, you can enable it manually by using the command ‘sudo systemctl enable systemd-readahead-collect systemd-readahead-replay’ and then rebooting at least twice. ‘systemd-analyze blame’ command will give you a text output of times taken by apps/processes. ‘systemd-analyze plot > plot.svg’ command will plot you a very nice graph of the sequence things get loaded in and how long they take. Thank you ‘mips’, I’m definitely going to try that!. It’s a great post, but sorry, this is not related to ur post. I appreciate your comparison work a lot, I’ve been following ur site for some time, but I couldn’t find any feed / subscribe button, for me to subscribe. It would be great if you could have one. So that I can get subscribe and get your new post to my mailbox right away – I can read them without visiting ur site time to time. Thank you Asanka. It’s just that I’m trying not to use too many plugins on top of WordPress and planing on to use a different theme in the near future. But I’ll see what I can do :). P.S: I have added an e-mail subscription widget to the blog. Hope it helps you out. You’re welcome, and Thank you also :). For a release thats not even version 1.0, its rock steady. The mhwd kernel install is the best in any Linux distro I have tested. On my IVB Optimus i7 laptop, my CPU runs cooler than Windows 8 and I get same battery life with kernel 3.11, TLP and Intel thermal daemon installed out of AUR. The Manjaro team led by PhillM has done a superlative job and as Ubuntu bought desktop Linux to the world, Manjaro will bring ARCH to the rest of Linux world as well as others who want cutting edge minus all the drama of system breakage. Gayan, check this advice from a site. Thank you Pmulax. However, the reason that I haven’t disabled that option is because by doing so, it disables ‘auto suspend’ power saving feature for all the USB devices. But given the situation, this could solve the issue, so I’ll try it. TLP which is in AUR is a far better and actively developed tool than laptop-mode. I suggest you check it out. Thank you Arup. 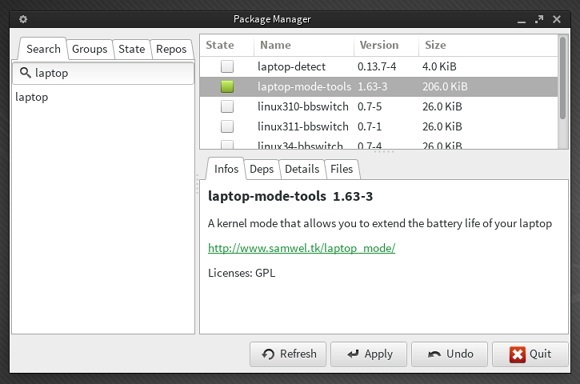 I actually have used it in Ubuntu, and yes, I too find it to be a bit better than ‘laptop-mode-tools’, mostly because it has a single configuration file and is easy to tweak :). nice site…found some rather useful info whilst having a nose around. hi! i have you found any solution to that ‘clack’ sound?? it happened to me couple of times too and now i’m afraid to use manjaro on my laptop. No I haven’t. I’m using Ubuntu 13.10, and interestingly, every now and then, Ubuntu 13.10 too also does that. So perhaps it has something to do with the Kernel (?). Anyhow, the below article contains some interesting information, including few suggestions (please use them at your own risk), though I’m not sure if they’re going to help you out or not.